The Lo Lo are a vanishing tribe living in the poor and mountainous region of the far north. They survive mainly on subsistence farming and raising livestock. 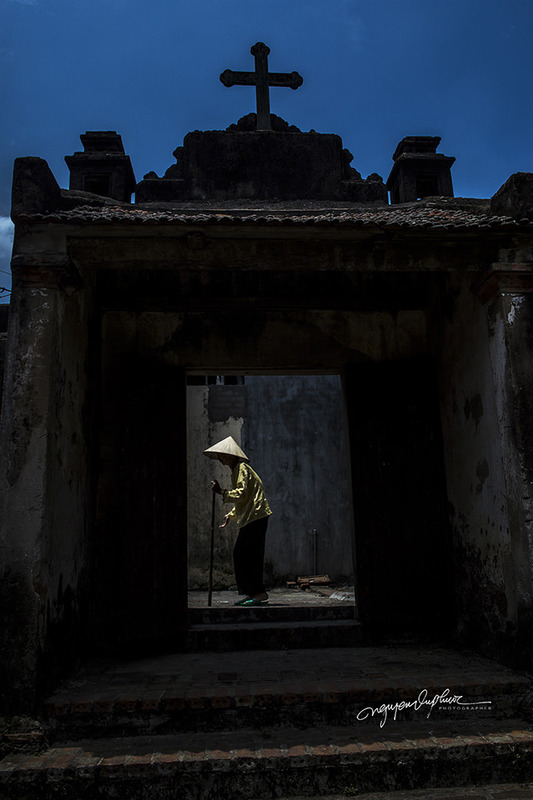 “Phuoc” broke into photography in a rather unusual way. It was two years after graduating from art school in 1991 that he founded Kien Vang Advertising in Saigon. The angle in his mission statement was to bring next level fine art design and imagery to the country’s ad world. Money was tight in the beginning, so rather than hiring professional advert photographers, Phuoc took his first camera – a German made Praktika – and taught himself on the job! 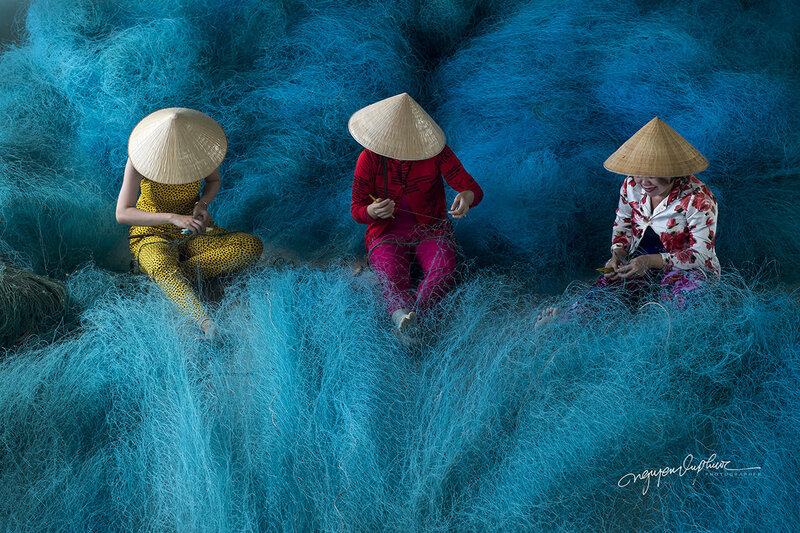 The rest came over time as part of his natural curiosity in diverse peoples, cultures and landscapes, all of which Vietnam is blessed with in abundance. 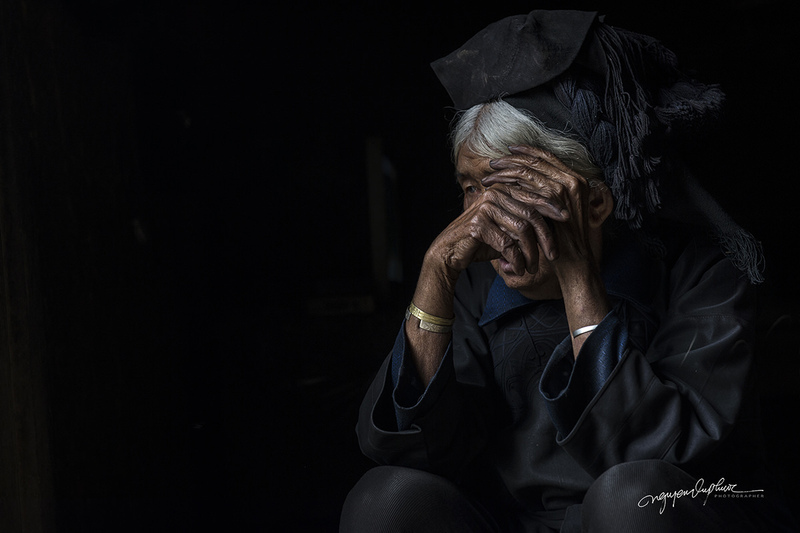 Lost in Thought – Woman of the Black Ha Nhi tribe. 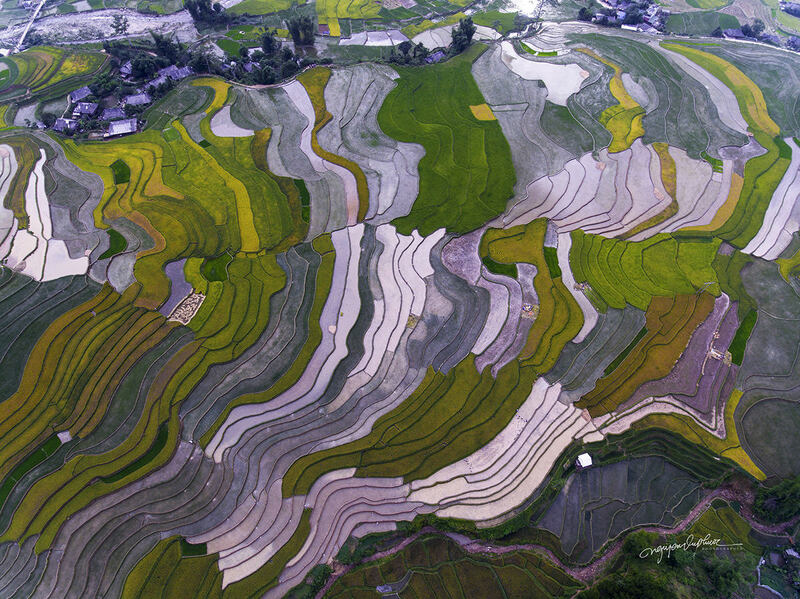 Y Ty, Lao Cai Province. 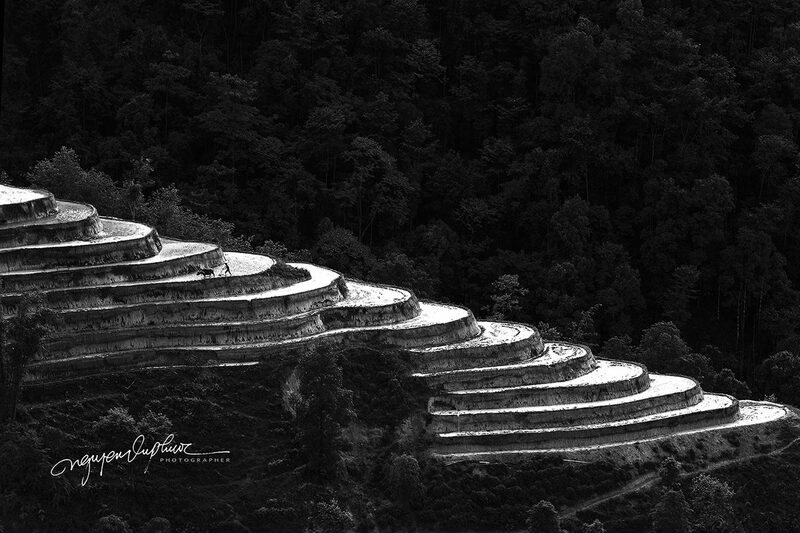 Y Ty is a stunningly beautiful and secluded rice terrace region. 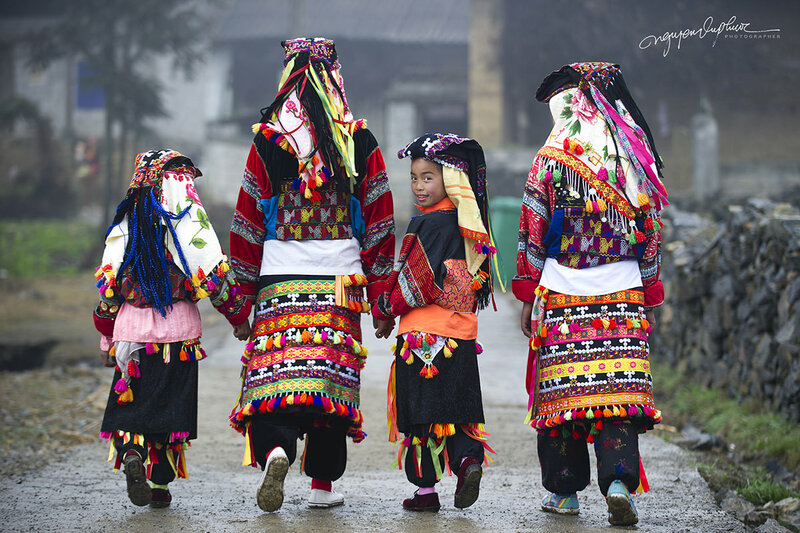 The Black Ha Nhi are a shy people whose traditional culture remains intact by virtue of its relative isolation. 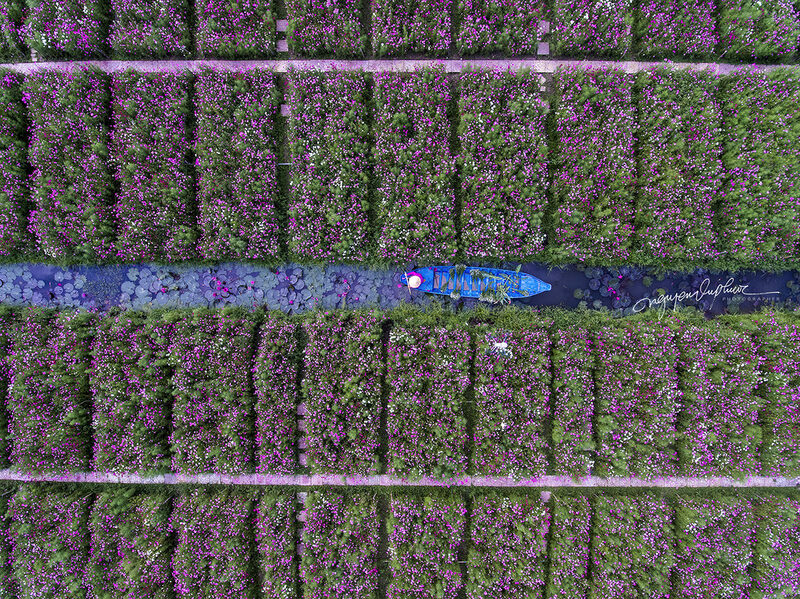 Always busy with an array of advertising and photography projects, what is closest to Phuoc’s heart is the combination humanitarian-documentary work he does. This includes photo essays, fundraising efforts, and giving personal assistance to those suffering such afflictions as birth defects from Agent Orange, and heinous acid attacks. 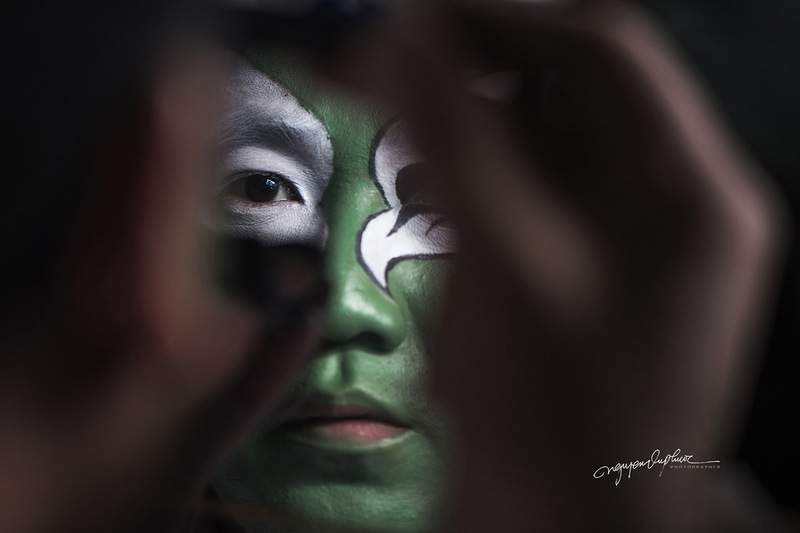 A performer applies makeup backstage before a Hat Boi performance. 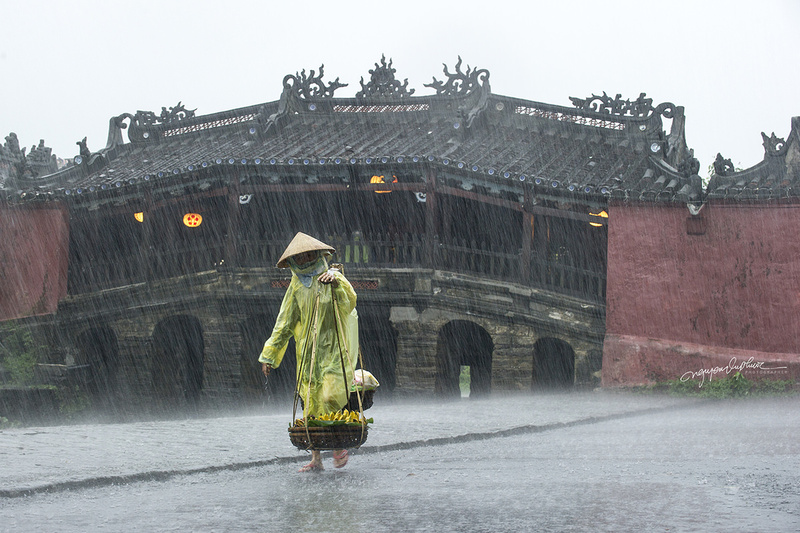 Hat Boi is a form of ancient theatre in the central and south regions of Vietnam. We caught up with Phuoc at the Yesterday Piano Café in Saigon last month. Over lunch and live piano music, we had the opportunity to ask a few questions about his photography, and if he’d be kind enough to offer some advice for aspiring photographers. 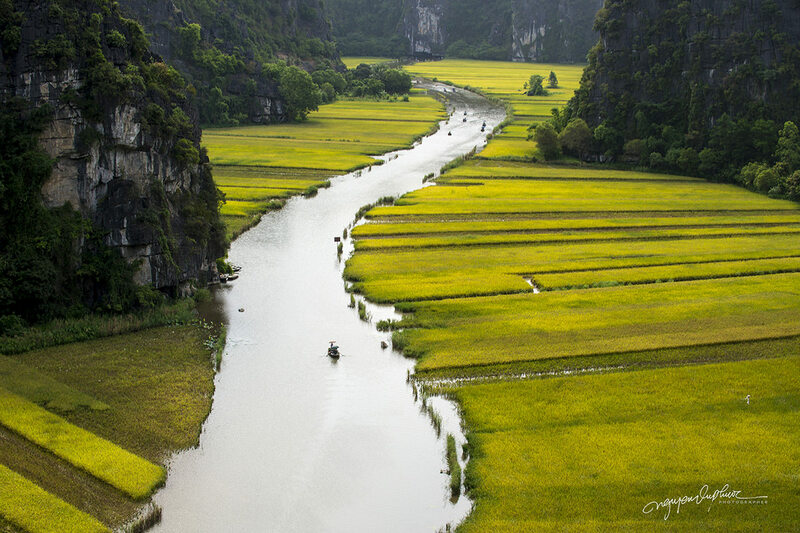 Limestone and Rice – Tom Coc, near Ninh Binh. This is not a drone shot. Phuoc made a rather precarious climb up a limestone cliff to reach this position. Photography Life: Just to get this out of the way up top, what gear to you usually take on the road for general travel photography? 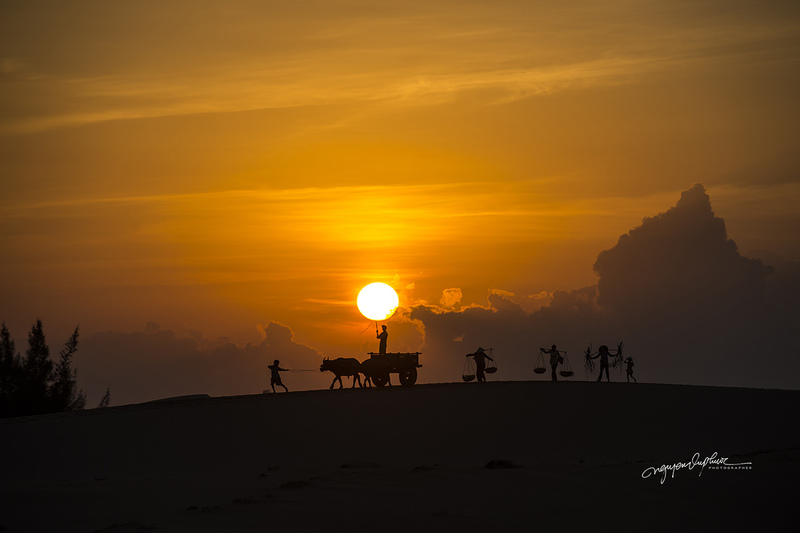 Nguyen Vu Phuoc: Well… My two main cameras are Nikon D4s and Sony A6500, which is mirrorless. I use it mostly for street work, as it’s quiet and versatile with the Sony 18-200mm. Sometimes for magazine shoots also. For the D4s I carry the Nikkor 24-70mm f/2.8, 14-24mm f/2.8, 70-200mm f/2.8, a 16mm fisheye, and two macros – 60mm and 105mm. 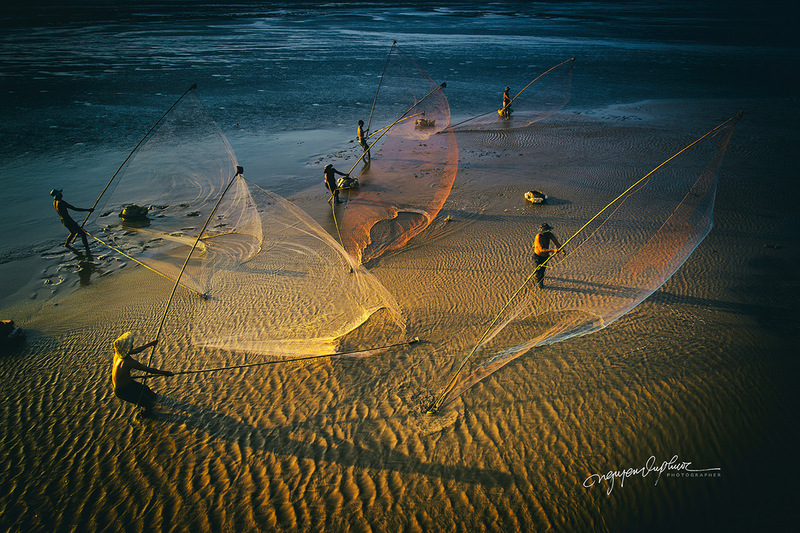 This type of net fishing is designed to catch shrimp, crab and small fish along the waterline when the tide recedes. 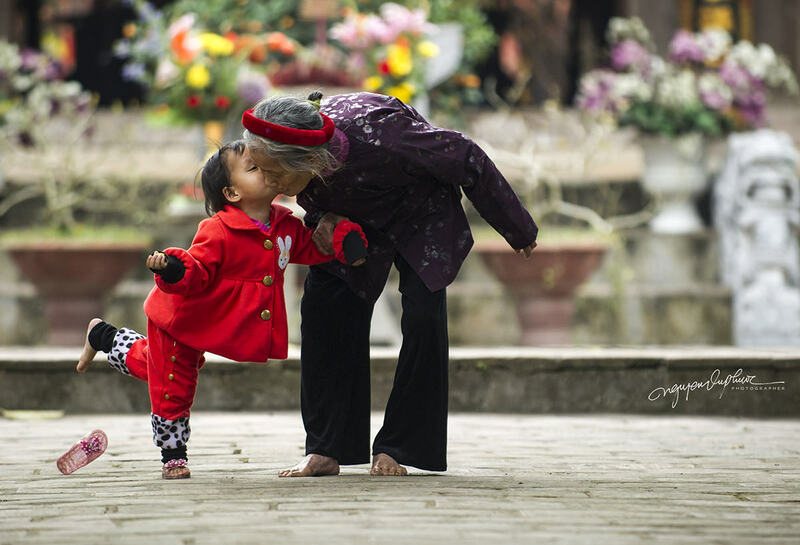 A granddaughter kisses her great grandmother in the park, and loses her shoe in the process. PL: And I bet you’re not done yet. Phuoc: Of course not! I usually take my GoPro Hero 5 and Phantom 4 drone. I love my drone. For tripods I have a little GorillaPod Flex which comes in very handy at times, and a Manfrotto 055. PL: Switching gears… What goes through your mind before you decide to take a photograph? Phuoc: Not much really. I just react. If it says, “hey, take me!” I take it. That means all or most of the key elements are there – good subject, good light, etc. But the most important element to me, is the potential to touch the viewer, preferably here. (Phouc taps his heart with his index finger and smiles). These are the photos I love most. There less than 5,000 Khmer (ethnic Cambodians) residing in O Mon, and about 1.3 million living in the country, mostly in the southwest. 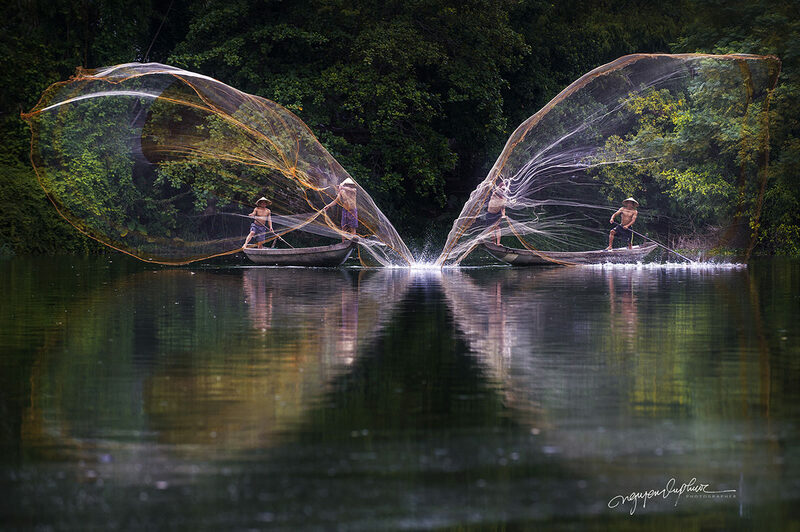 Double Vision Fishin’, near Hue, central coastal Vietnam. PL: Based on your experience and your knowledge of today’s market, what two pieces of advice would you offer aspiring photographers seeking a career in photography? Phuoc: The most important is developing a style that sets you apart from the crowd. Easier said than done, I know. It’s a process. Technical mastery is important, but it’s not enough. I suggest to study the greats and what made them great. Not just their images, but how they came to make them. Their personal story working behind the camera. In the beginning, I think it’s OK to copy the styles of those you admire. It can be good practice learning to see through the eyes of the successful. But once you are able to, it’s time to take what you have learned and try different things. Be willing to take chances and make mistakes. Get feedback from experts, not just from your mom or Facebook friends. Spend as much time working in the field as you can. Get so your camera settings become second nature, even if it means taking a thousand pictures of your cat. Hone your skills. Too many armchair photographers these days. In the background is the 17th century Japanese Bridge, a famous old town landmark. During bygone centuries when controlled by the Cham Dynasty, the popular tourist destination was the busiest sea trading port of the South China Sea. Second advice, understand that it’s an extremely competitive business on multiple levels. There are a lot of people out there – including some major agencies – taking advantage of photographers by paying little or even nothing. Learn how the business side works and find doors to stick your foot into. Become a skilled self-promoter. If you don’t do it, who will? Leverage social media. Make calls, send emails, make submissions, knock on doors. Be relentless. Farmer and buffalo working hard as rice planting time approaches in Mu Cang Chai, one of Vietnam’s legendary rice terrace regions. The Cham people, who ruled most of central Vietnam and beyond for nearly a thousand years, are now a poor and somewhat persecuted minority. 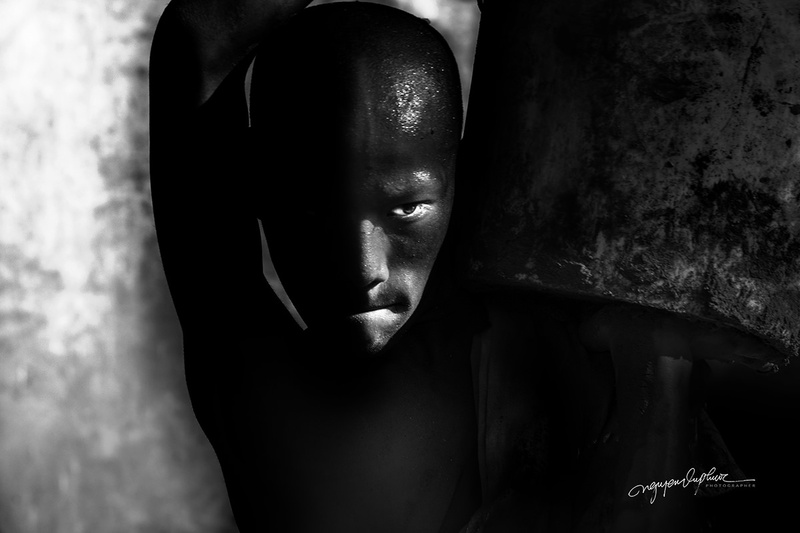 PL: Part of earning a living for many pro photographers in this era, is conducting workshops of one kind or another. In your case, it’s travel photography workshops in Vietnam. Is there one thing in particular that you impress upon visiting travel shooters that others may overlook? Phuoc: One thing is the fun thing. I think having fun is essential for a travel photographer. It helps in many kinds of photography actually. I am very friendly and proactive with the local people we encounter on a group trip. I am always playful and joking with them. When the participants see us having a good time it becomes infectious. It relaxes everyone and gets you as a photographer closer to those you wish to photograph. PL: What about the language barrier? Phuoc: People are people. Many times we visit people who speak no Vietnamese. You gesture, you smile. You take interest in what they are doing, what they are wearing, in their children… There is always something to help bridge the natural gap between a foreigner and a native. This is not easy for many, but the more you try, the easier it gets. And the better your pictures get as a result. In travel and cultural work, a sincere smile is almost as important as your camera. It creates the atmosphere that opens to access. Good access allows your camera the chance to do its best job. Born with no arms due to the ongoing and horrific effects of Agent Orange, this aunt has learned to bathe her nephew and do many other tasks with her feet. She can also write. PL: Tell us a little about Labor of Love. It’s a beautiful book start to finish, truly. The childbirth images are extraordinary. I’m sure people wonder how you managed to get such remarkable access? Phuoc: By not taking “no” for an answer. 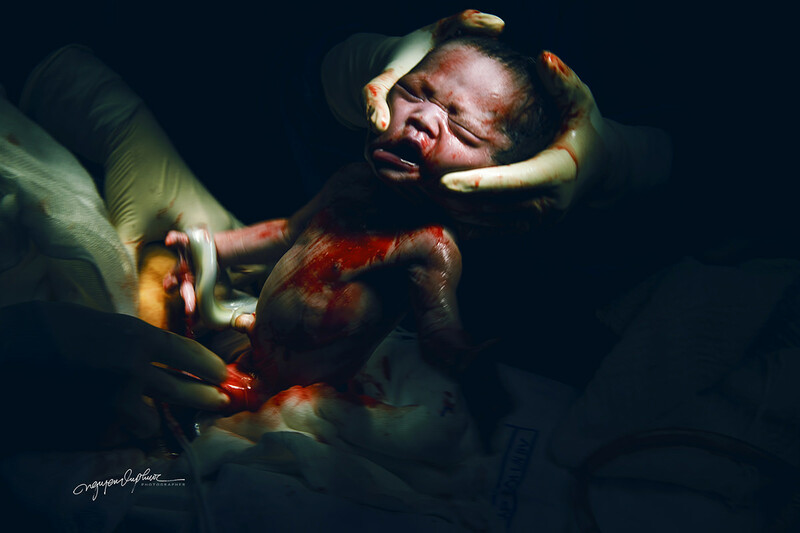 All the childbirth photos were taken at Tu Du, Saigon’s largest hospital. Getting permission from hospital officials took some doing. 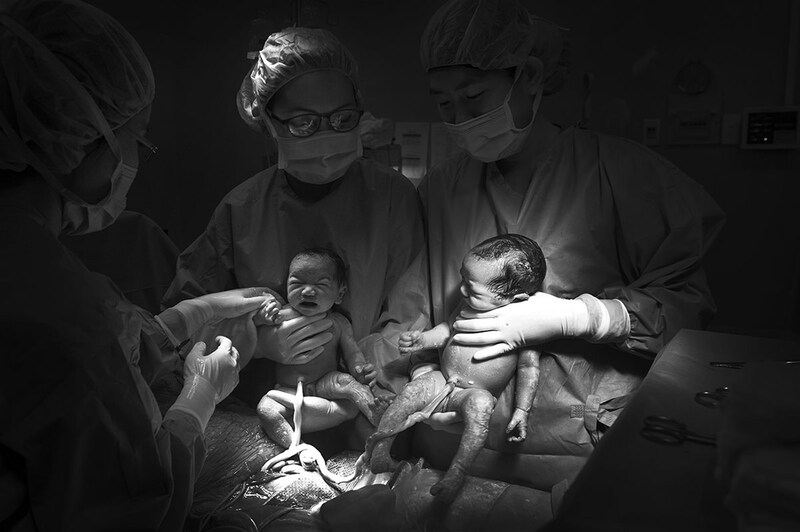 To photograph or video a child’s birth is still something quite rare for people to do in Vietnam. No, yes, maybe, not possible! But eventually they agreed. That was the easy part. More difficult was getting the women to give their consent. This was never easy, even from my own wife! As things worked out – after almost 17 years on the project – she and my baby daughter ended up being my final two subjects. I was so much more nervous and worried photographing them than the others, but once my baby daughter was safely out of the womb I was full of relief and joy and snapping away like a crazy man. Now – getting permission on scene with women who were already in labor – that was the real challenge! PL: Wow. How did you manage that? Phuoc: By being sincere and as compelling as I could. When people understand your purpose and agree with its merits, they can see themselves as part of something good. Then they are more likely to consent. Of course under the urgent circumstances this was often quite difficult. I had much more failure than success, but this is photography. You just keep going. PL: Seventeen years is a long time to spend on a single project. 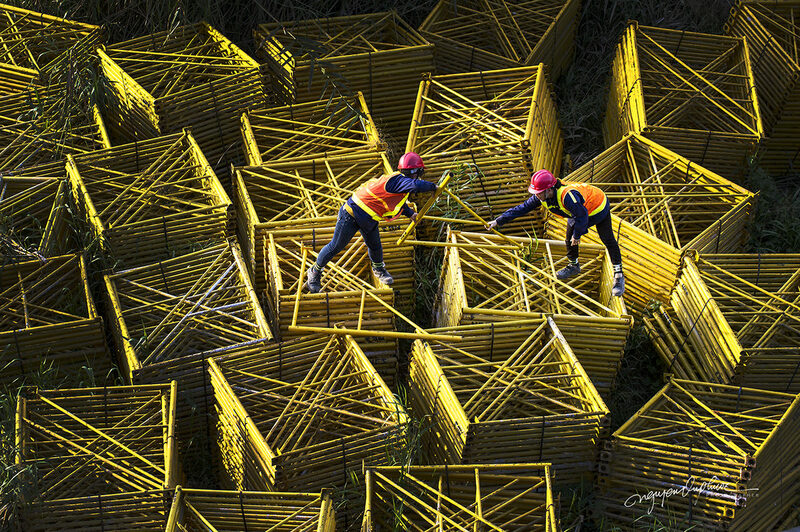 Phuoc: I have many long term projects, and never enough time! I just made sure that whenever Labor of Love would go onto the back burner, it never got pushed off the stove. It was a labor of love for me too. Especially when my wife became pregnant, which gave me the final push and produced some of the best photos. I got lucky in the end by being slow. It allowed the project the space to finally reveal its own conclusion. Phuoc’s lovely wife and daughter minutes after she was born. PL: We heard the book launch was quite an event. Phuoc: Yes! A lot of excitement with this exhibition. All the mothers and newborns I had photographed years earlier were special guests of honor. I remember watching them find their images on the wall. The kids would look at themselves in such curious wonder, not quite believing it was them until their mothers confirmed. I expected this to be an interesting and fun event, but didn’t realize the power it would have for them. (My daughter was still way too young). The images created a way for each child to share the mother’s memory of their most sacred and profound moments together. I was really quite touched by it. I think everyone was. PL: Phuoc, thank you for the opportunity to interview you, I am sure our readers will find it useful and hopefully inspiring! Phuoc: You are most welcome.